Macotahara, a Japanese blog about everything Apple, has a proven track record when it comes to generating leads about the Cupertino company's future products. If the blog's recently leaked info about the next generation Apple slate turns out accurate, then iPad fans the world over should have plenty of reason to celebrate come March -- that's next month. According to Macotahara's five-liner report, Apple seems to be preparing for a special yet small event scheduled at the end of this month (February) mainly to announce iPad 2. Release date of the iDevice, on the other hand, seems to be considered at March, though it's not clear if it will be started at the same time all over the world. 1. iPad 2 - like iPhone 5 - will run on the new Apple A5 chip, which is at least 4 times more powerful than Apple A4. 2. Having a faster processor makes it possible for iPad 2 to have a Retina Display and 1080p Video Playback capability. 3. 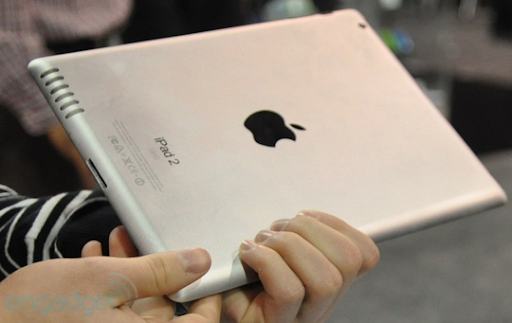 Based on the 2011 iPad mock-up spotted by Engadget at last month's CES 2011, the iDevice will have a flat rear similar to that of iPod Touch 4G, a large speaker unit at the back covered in metal mesh, and two cameras - one in front and the other at the back. Note that Apple hasn't confirmed nor denied any of these reports. Do you intend to get iPad 2 this year? What can you say about all these leaked information about the device?